'Death or Glory Vol. 1: She's Got You' review – AiPT! Does Rick Remender’s latest stay on the road or go off the grid? Having written for Image Comics since 2005, Rick Remender has produced so many titles and at this point, he has five comic books that are currently ongoing. In between these titles, Remender wrote the excellent sci-fi Tokyo Ghost, which finished after ten issues, so whether or not he has a long plan for his latest comic Death or Glory, does it stay on the road or go off the grid? Set in the near-future where the economy has gone way down (yep, that’s going to happen a few years away), the last men and women are fighting for true freedom on the open road. In desperate need for money that will pay for her father’s life-saving surgery, Glory Owen is willing to pull off a heist that leads to a high-speed chase across the American West. 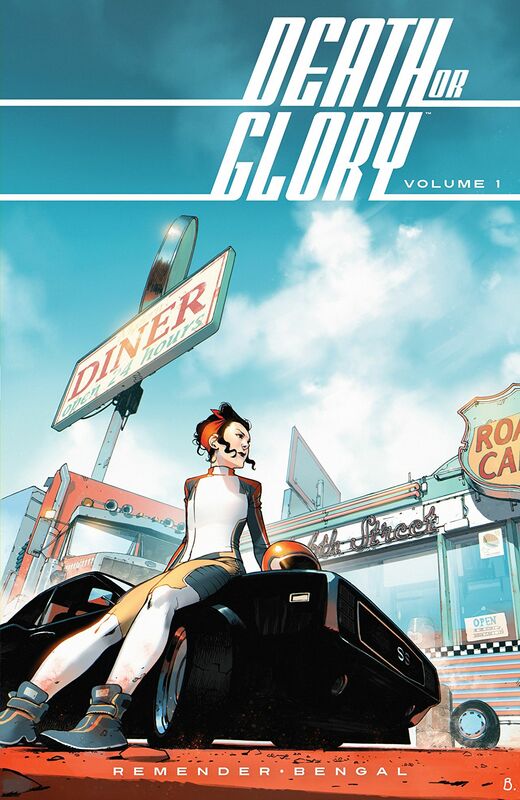 Despite being known for his grand sci-fi concepts such as Black Science and the anarchic subtext of Deadly Class, Death or Glory feels like a step backwards for Remender in terms of ideas and writing in general. Considering that the writer often uses his works as allegories for social commentary and politics, there isn’t much of a subtext behind this somewhat updated version of the American Old West. As its best displayed on the cover of the third issue, which is a direct homage to the poster of the Steve McQueen movie Bullitt, Remender is using the classic 60s and 70s American road movies in America as his Bible, which makes the story and characters feel all too familiar. Glory Owen is your "Strong Female” archetype with an emotional backbone driving her motives, which is the cliché of a dying parent. Although the third issue explains the entire backstory of our protagonist from her upbringing in a convoy of truckers to her failed marriage with the man who is ultimately the one-dimensional rich baddie. Despite all of that, there is this constant disengagement as the book is juggling too many characters who are rarely developed. It’s surprising not to feel compelled over the dark subject matter of kidnapping immigrants and smuggling their organs. Having worked for both DC and Marvel with characters such as Supergirl and Spider-Gwen, you can see why this title would appeal to Bengal. Known for his brightly colored and cartoonish character designs, Bengal’s art can seem weirdly misplaced with the potentially gritty narrative. That said, he knows how to draw car chases where you see these cool-looking vehicles skidding and impacting each other. With a number of ongoing comics under his belt, some are going to succeed more than others, and sadly Death or Glory has not brought out the best in Rick Remender’s writing. ...even if his art never fits with the potentially gritty narrative. The story and characters are generic due to Remender’s intentional throwback towards a particular era in American cinema. Feels tame and small, especially compared to the writer’s previous outlandish works.